There simply is no way around it; acclaimed theoretical physicist STEPHEN HAWKING has died and been replaced [maybe even multiple times]. ……….I don’t know why I [or the masses at large for that matter] have not realized this by now. I was recently awakened to this fact by researcher MILES MATHIS. ……….In 1963, at the age of 21, HAWKING was diagnosed with Amyotrophic Lateral Sclerosis [also known as “ALS“ or “Lou Gehrig’s disease“]. ……….Let me repeat that, NINETEEN SIXTY THREE. That was 53 YEARS AGO. ……….The prognosis for someone diagnosed with ALS is DEATH WITHIN 3 – 5YEARS. ……….ALS is a degenerative motor neuron disease. The motor neurons die, thus making it impossible to voluntarily control ones muscles and causes extreme muscle atrophy. 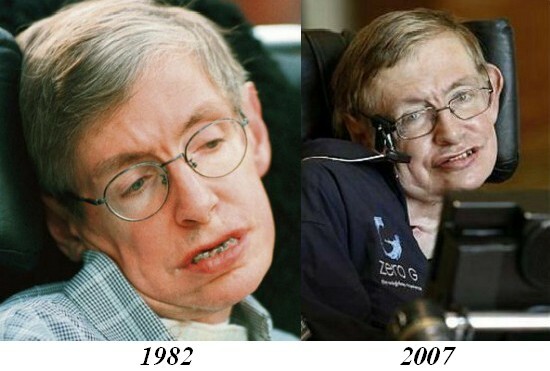 ……….Yet, instead of dying within 3 – 5 years, HAWKING has supposedly thrived for 53 years?! Don’t buy it! ……….It has been independently confirmed that he doesn’t need the teeth for eating, and he doesn’t come across as the vain type, getting false teeth to improve his looks [especially considering that the new teeth look worse than the old ones]. The teeth are a major giveaway! Does he look like he has aged 25 years in these photos? NO! And there are absolutely no records of him having any sort of plastic surgery. Again, he doesn’t in any way, shape nor form appeared to have aged 20 years between these photographs, whether judging by normal standards or, especially, for someone with a degenerative disease! ……….ALS is also widely-known to cause dementia, yet we are expected to believe that he has had it for 53 years and remained a leading theoretical physicist, author and university professor all this time? Don’t buy it! ……….So, when did they make the switch? Probably in 1985. 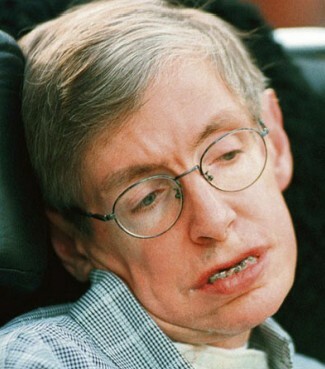 In that year, HAWKING came down with a life-threatening case of pneumonia while visiting the European Organization for Nuclear Research in France / Switzerland. It was so bad that his doctors urged his wife to take him off of life-support. ……….So, the real HAWKING most likely passed away [or was murdered] in 1985. This would correspond with events in his personal life, as it was around this time that he and his wife, JANE HAWKING split up [though they didn’t officially divorce at that time], leaving her free to get with JONATHAN JONES, whom she had been seeing since 1977. ……….The HAWKINGs “officially” divorced in 1995. STEPHEN then supposedly married one of his nurses, ELAINE MASON. Was there another HAWKINGswitch made around this time? ……….STEPHEN and ELAINE officially divorced in 2006. Again, was there yet ANOTHER HAWKING switch made at THIS time as well? 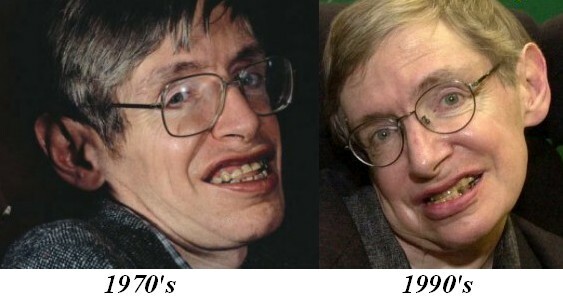 Remember, it was in 2007 [the very next year] that HAWKING started making loads of public appearances. ……….So, it is by no means going out on a limb to say that NO ONE CAN LIVE WITH ALS FOR 53 YEARS, no matter how good their care is! ……….The longest-living afflicted individual that I know of is former heavy metal guitarist JASON BECKER, who has lived with ALS for 26 years. 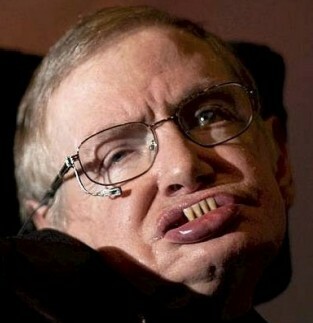 ……….So, if HAWKING has been replaced, we must ask ourselves WHY? Why perpetrate this elaborate ruse? What is the agenda behind it? Has “HAWKING“been kept in a drugged-up, suspended animation so that ThePowersThatBe can use his famous name and persona to push their agenda? ……….He has used his position to try to proliferate global government, urging Britain not to leave the European Union. ……….This meshes perfectly with the New World Order‘s agenda. Denounce any Gods that the masses may believe in in order to usher in a new “God” and a one-world religion and government. This will coincide with the global launch ofProject Blue Beam. ……….Whether HAWKING‘s opinions and ideologies on physics constitute mis/disinformation is in the eye of the beholder. Louder and Louder War Drums Announce: USrael/NATO under Illuminati Pressure for War on Russia, Syria, Iran Soon. Russia: They Are Nervous. They Have Something to Conceal! “As Michel Chossudovsky says, the Western politicians and presstitutes who serve them are driving the world to extinction. Wladimir Putin: “Maybe Russian Jews meddled with the US elections!” – see Jew – even King of Jews – Putin´s Jewish Oligarch friends . “Such claims have one root cause – a hatred of Jews” (Ksenia Svetlova, Member of the Knesset) – Haaretz 10 March 2018. So does Jew Putin really hate Jews, whom he has cherished so much? Certainly not. Consequently he must be under Masonic orders – which he obviously is. Skripal happens to be a British citizen. Prime Minister May who attacked Russia vehemently in the House of Commons does not have a shred of proof that Russia poisoned Skripal – apart from the poison purportedly being from the Soviet days (and thus possibly from the Ukraine – or false flag?) – and that Putin has a reputation of murdering his enemies (Litwinenki, Politkovskaja, and many others). But western intelligence services have an equqally heinous reputation for making false flags – – e.g. NATO´s Gladio and many others and here). That this solitary case can even be indicated as cause of WW3 is preposterous – but it shows how tense the East-West relations have been artificially escalated by some very obscure forces. Sputnik 15 March 2018: Russian intelligence veteran: Russia had no reason at all to poison Skripal. He had been living in Britain since 2010, meaning that he didn’t possess any sensitive information [pertaining to Russian intelligence activities].Moreover, Skripal was being watched by MI-5, but was working for MI-6. Even assuming that someone might want to get rid of him, no one would risk doing that. In fact, tensions have been developed in the Middle East by Masons on the Eastern and Western (Thesis/Antithesis) sides used by the London City and its masters to provoke the final Biblical war beginning with the destruction of Damascus (Isaiah 17) developing into the Gog/Magog war (Ezekiel 38,39), which the rulers of the world, the Chabad Lubavitch Pharisees, and here see as the precondition for the coming of their Luciferian messiah, ben David. They already have appointed Netanyahu as their forerunner messiah. ben Yosef. Russian President Vladimir Putin said in an interview released Wednesday that US President Donald Trump had left a good impression on him, and that he has “no disappointment at all” in their relationship thus far. Putin did not have the same admiration for the US political system, however, which he said has “demonstrated its ineffciency and is eating itself up.” Deutsche Welle 7 March 2018. You can see it: Putin likes Trump. It is, however, necessary to understand the friendship between Putin and Trump. They do not want to fight each other. But they are Freeemason puppets – and have to fight each other when their masters command them to do so. First it is necessary to recognize that Israel and the US under Donald Trump is practically one unit. Look at Netanyahu´s radiant face: He has got what he came for. And he mentions it: “We have to stop Iran. Our security services cooperate closely. Thank you for your tremendous friendship.” Trump: “We are very, very close militarily”. “By tapping Mike Pompeo to be Secretary of State, Trump is handing over the reigns of U.S. diplomacy to one of the most hawkish members of his administration.For all of Tillerson’s flaws, he served as a check on Trump’s more hawkish positions. With Pompeo, Trump’s worst instincts on Iran and North Korea will be reinforced. Pompeo’s not only said his goal is ‘rolling back’ the ‘disastrous’ Iran nuclear deal, he earlier suggested military strikes as an alternative to diplomacy: CNN 13 March 2018: Pompeo has advocated for military strikes against Iran while lobbying hard against the nuclear deal with Tehran. He’s also been a force behind the administration’s drive to squeeze North Korea. Among the institutions targeted in the new sanctions for election meddling were Russia’s top intelligence services, Federal Security Service (FSB), Main Intelligence Directorate (GRU) and the Internet Research Agency. Global Res. 14 March 2018: Either Donald Trump fires all the apprentices who might slightly hesitate to wage a much larger world war and lets the bombs fly, or he will be replaced by one who will. Signs are that he has learned what his job entails and the world will suffer more death and destruction as a result. SO HOW IS THE FOLLOWING TO BE UNDERSTOOD IF IT IS NOT WAR PREPARATIONS? Washington´s Blog – Eric Zuesse 8 March 2018: ISIS is defeated in Syria. Nevertheless Pres. Trump applies in Congress for another 60.-65.000 US troops on the ground in Syria. Purpose: Illegal regime change – although Assad obtained 89% of Syrian votes in internationally surveilled presidential elction 2014. And note: When the Western Illuminati MSM writes about a government which their Jewish masters do not like, they call such governments “regimes” – while they never write so disparagingly of the totally undemocratic EU, Germany, France and other governments who put opposition into prison for “hate speech”, “fake news”, dubious Holocaust denial (Blogger Der Honigman died during imprisonment – although he never denied Holocaust). But even forbidding people denying Holocaust is characteristic of a Zionist ruled “regime”, which never mentions the real masterminds behind the Holocaust! ANSAmed 6 March 2018: The Trump administration is considering military action against the Syrian government after news that it is continuing to use chemical weapons, reports the Washington Post (No proof whatsoever). The Telegraph 28 Febr. 2018: Satellite images reportedly show Iran has established a base outside of Damascus to house missiles capable of hitting Israel, crossing a “red line” for the Israeli government as it struggles to stop Iranian entrenchment in Syria. The base is located around eight miles north-west of Damascus and is being run by the Quds Force, the expeditionary arm of the Iranian Revolutionary Guard. If the base is confirmed to hold Iranian missiles, its presence will likely increase the tensions between arch rivals Israel and Iran over Syria, which has been growing sharply in recent months. Western diplomats and the UN have repeatedly warned such skirmishes could easily erupt into a devastating full-blown conflict, potentially pitting Israel against Iran and its allies in both Lebanon and Syria. Iran’s arming of Hizbollah in Lebanon and its establishment of bases in Syria is usually presented by Israel as evidence of Iran’s determination to wipe out the Jewish state. Sputnik 28 Febr. 2018 Israel is taking all the possible measures to prevent Iran’s military expansion closer to the Israeli northern border via Syria, Nachman Shai, a member of the Knesset, told Sputnik on Wednesday. “I cannot confirm whether [if] it is true or not, but in general we do not want to see Iran in Syria. We do not want to see Iran on our border. We will do our best to stop them as far as possible from our border.” Shai said. Amid the tension, Israeli Prime Minister Benjamin Netanyahu said that Israel will further act to prevent Iran from establishing the permanent presence in Syria. Haaretz 1 March 2018: “Southern Lebanon is where the next war is coming,” US Senator Lindsay Graham said at a press conference following the bipartisan trip to the Middle East that he had participated in. Graham had referred to a report in January that revealed that Hezbollah, backed by Iran, has been constructing a precision weapons factory in Lebanon despite continued Israeli calls for the group to disarm. He said, Israel wanted ammunition from the US and U.S.’s backing should Israel have to resort to striking civilian targets in Lebanon, where it believes Hezbollah is operating. DEBKAfile 23 Febr. 2018 Two fifth-generation Sukhoi-57 stealth fighters landed Monday, Feb. 19 at Russia’s Syrian air base, along with 4 Su-35 fighters, 4 Su-25 strike aircraft and an A-50U radar command-and-control platform. Another 2 SU 57 have been sent to Syria acc. to Sputnik 24 Febr. 2018 – making the total of 4. Russian lawmaker Vladimir Gutenov told Sputnik that the presence of the Su-57s will doubtlessly send a political message, serving as a deterrent “for aircraft from neighboring states which periodically fly into” Syrian airspace uninvited. It is also Russia’s response to Israel’s air offensive on Feb. 10, which targeted the shared Russian-Iranian T-4 air base near Palmyra and smashed four Iranian Revolutionary Guards forward command centers in Syria, after downing an Iranian drone. It is also seen in Moscow as a challenge for Israel’s newly acquired fifth-generation US F-35 combat aircraft. Does Putin intend to order his mighty airborne strike force to go into battle against the US or Israel in the boiling Syrian arena? The very presence of the Su-57 across the border has had the instant effect of reducing the Israel air force’s freedom of action over Syria and Lebanon. Sputnik News 9 Jan 2017 – Putin´s mouthpiece: Israel has all the hallmarks of a rogue state! DEBKAfile Febr. 28, 2018 Lebanese Prime Minister Saad Hariri’s switch of loyalty to Hizballah and Iran shocks Riyadh and dismays Israel. Bill van Auken, World Socialist Website 7 March 2018 Israeli Prime Minister Benjamin Netanyahu’s five-day trip to the US has been dominated by a growing drumbeat for war against Iran, a regional struggle that would eclipse the immense carnage wrought by the past 15 years of uninterrupted US military intervention in the Middle East. The Israeli prime minister spoke in apocalyptic terms of Iran’s growing influence in the Middle East, declaring “darkness is descending on our region” and pointing to a map in which countries that he alleged Iran was dominating were painted black. “Iran is building an aggressive empire: Iran, Iraq, Syria, Gaza, Yemen, more to come,” he continued. As Trump and Netanyahu were meeting, The Washington Post revealed that the Trump White House, the National Security Council and the Pentagon have begun drawing up plans for a major new US military assault on the Syrian government of President Bashar al-Assad. According to the Post account, there were sharp divisions among the generals who form the core of the Trump administration, with McMaster strongly in favor of an attack, and Mattis “adamantly” against it. The domestic political crises faced by both US and Israeli leaders only serves to accelerate their drive to war. Leading Democrats, including Senate Minority Leader Chuck Schumer and House Minority leader Nancy Pelosi delivered speeches to the AIPAC convention unequivocally supporting Israeli aggression and suppression of the Palestinians as well as confrontation with Iran. Indeed, the Western elite appears nervous and under stress. They seem to be whipping up an Anti-Russian mood at a breathless speed – and without any proof in the spy poisoning case, they all immediately stick together – uncritically risking a war with Russia. I have a suspicion: They are obeying orders from above – from the Jesuit – Illuminati – Chabad Lubavitch orders via their Superlodges. Otherwise, there would not have been this immediate unanimity – but a lot of discussion to and fro, pro et contra. As I wrote on 13 June 2017: The 2009 Brookings paper “Which Path to Persia“ is a signed and dated confession of the West’s proclivity toward using terrorism as a geopolitical tool. While Western headlines insist that nations like Iran, Russia, and China jeopardize global stability, it is clear that they themselves do so in pursuit of global hegemony. The Plan was elaborated by Rothschild´s US lawmaker Brookings. This is what General Wesley Clark hints at in the above video. USrael knows very well that hitting Iran means hitting Russia.